The Garden Plot: GMG's Friday Find: No Complaint Composting With This Sleek Shredder! 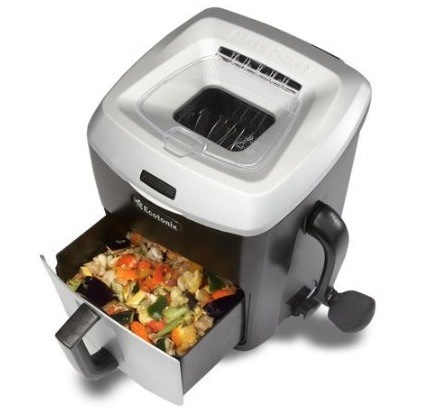 GMG's Friday Find: No Complaint Composting With This Sleek Shredder! Finally! A countertop pre-composter that takes the yuck, smell and mess our of recycling food scraps. The Green Cycler, invented by Gail Loos, a single mom frustrated with efforts to find a product to grind kitchen scraps, has won the Pinnacle Award at the 2013 National Hardware Show. Designed as a new class of appliance, the Green Cycler is a food scrap shredder and recycling system that vastly improves organic waste recycling. By shredding organic material to the ideal size for composting, the Green Cycler speeds up the composting recovery cycle by 10 times or more. Plus, it's super sleek and pretty, kid-friendly, dishwasher safe and totally recyclable itself. 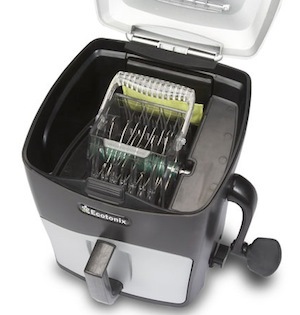 The innovative ecodrawer is easy to carry and holds up to 8 pounds of shreds. Once full, the drawer can be emptied right into the garden or containers where the nutrients feed the soil. This means a full circle cycle of table to garden to table, allowing natural composting to enrich the soil, your vegetables, and your body with super nutrient rich food. Plus, composting is on the rise, and mandatory city food scrap waste management is in the wings of many municipalities. Understandably, as we generate 35 million tons of food waste, 97% of which ends up in landfills. This decomposing organic matter generates 16.2% of the nation's emissions of methane greenhouse gas. Thanks to the efforts of one inventive mom, a product is finally available to help every household put the "cycle" in recycle without the mess, stink or yuck of other indoor compost bins. Shred your scraps, spread your scraps, and enjoy the benefits of composting. Happy shredding!